Tokachi Hills XNUM Green Season starts 2019 Mon 4 Day Saturday! Together with the opening, Tokachi Hills Garden Birraki will be held! ! We will present the cute viola seedlings of Quiz Rally and Gardener Select to the first XNUM Xp visitors. 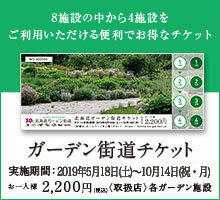 Ueno Farm XNUM X Garden Open Information! April 20 (Sat) 10:00-2019 Ueno Farm Garden Open! ! 10 Monday 14 day ended the operation of 2018 year.